Beautiful Mosaic of Genuine Sleeping Beauty Turquoise, Spiny Oyster Shell and Blue Lapis inlaid in Sterling Silver. 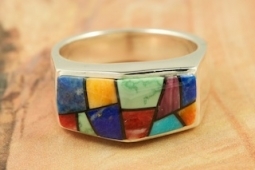 Stunning Ring Designed by Navajo Artist Calvin Begay. Signed by the artist.